The buildin call forwarding feature of the GSM pre is really poor. This app offers a detailed setup for each of the GSM call forwarding (call diversion) properties. You can get the current state, change it, set the number and save it. The addressing widget is used which is not offically documentated. To get access to the telephony service the app has to have a com.palm app id. 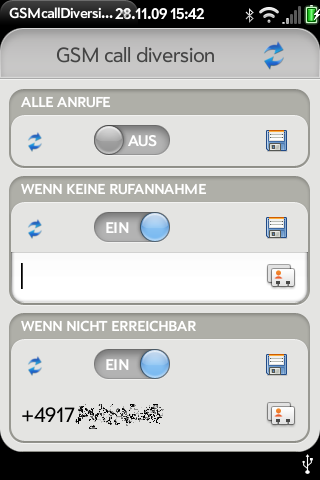 Supported locales: german, english, french. 0.9: first public release, version 0.9 is beta.